WWE Champion Kofi Kingston recently took to Instagram and shared a heartwarming clip from his home country, Ghana. The video shows a bunch of townspeople celebrating Kofi's WWE Title win at WrestleMania 35. Last weekend, Kofi Kingston made history at MetLife Stadium by pinning Daniel Bryan and becoming the first African WWE Champion in the history of the promotion. 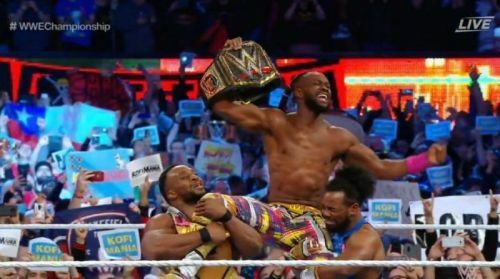 Kofi's win came in the wake of KofiMania, a fan movement that had taken over Tuesday nights, ever since the New Day member gave a splendid performance in a gauntlet match earlier this year. Much like Daniel Bryan's Yes Movement from five years ago, KofiMania forced Vince McMahon to change long-term 'Mania plans and put Kofi Kingston in the title picture. Kingston went on to thank everyone who had been with him ever since he kicked off his journey towards championship glory. The Dreadlocked Dynamo recently shared a wholesome video from his home country, on Instagram. Kofi stated that his mom sent him the video, which features a group of people from a town named Techiman, in Ghana. The group is seen celebrating Kofi's WWE Title win at WrestleMania 35. Kingston went on to post a heartfelt message on how the clip filled him with pride and joy. He added that he's astonished by the insane amount of people The New Day has inspired. Additionally, Kofi revealed that it has been a quarter of a century since he left his home country, and teased an eventual return. The New Day was nothing more than a thrown together three-man team, and have emerged as one of the biggest brand ambassadors of WWE, thanks to their colorful attire and light-hearted mannerisms. It wouldn't be surprising if Kofi and his New Day brethren end up visiting Ghana in the near future. What are your views on Kofi's win at 'Mania? Sound off! WrestleMania 35: Kofi Kingston Vs Daniel Bryan - WWE Championship, results, video highlights and analysis - Kofi Kingston WINS!